In this page you will find the detailed document that forms the rental agreement contract, which you are required to sign before riding our rental motorcycles. Minimum age: you must be at least 27 years old to rent 600-900 cc models, and at least 30 years old to rent larger than 900 cc models. 1 payment card for damage deposit: you will need to provide one payment card to rent a motorcycle. There will be an authorization of your card at the time of rental. See the required amount by viewing the page of the motorcycle model that interests you. Those requirements are described in [highlight text_color=”#ffd100″ bg_color=”#fefafa”]the page with the Rental Procedure Terms & Conditions[/highlight] [singleicon id=”fa-external-link” size=”1″] which you should review. Renter received Motorcycle which he examined and found it to his complete satisfaction, in condition acceptable and appropriate for the purpose he rents it. b) it has being used in violation of this agreement c) it has been used in violation of Greek laws. You have a 30-minute grace period after the designated return time is expired. After that, you have to pay a full day’s rental charge. If your delay causes a next client to postpone or loose his rental reservation, you will be charged for compensation equal to that client’s lost rental. If you want to prolong the rental period, you must notify us in writing at least 24 hours before the end of the rental period. In case of extension of rental, the terms and conditions of the initial agreement will apply unless otherwise noted. 4.1. Damage excess: You will be responsible for covering cost of damage and repairs to the motorcycle up to the amount designated in the front side of the rental agreement as “damage excess”. If the field “damage excess” is left unchecked or is marked as “NO”, then you are responsible for covering the entire cost of the damage or loss. (h) damage to the tyres and wheels including tyre punctures. 4.3. 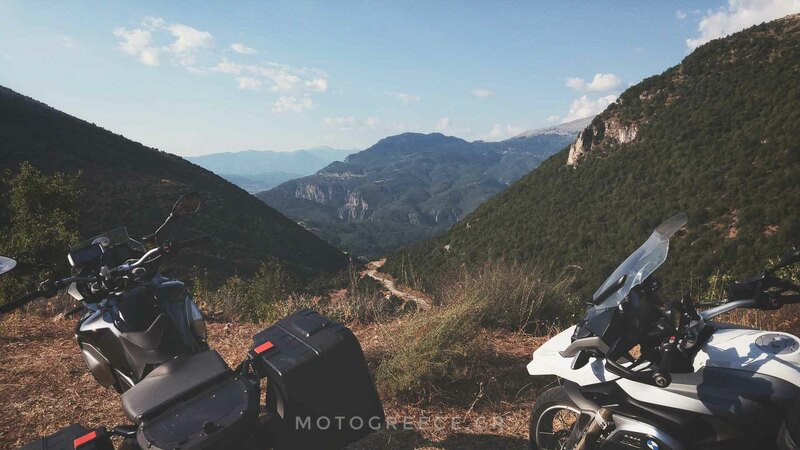 Where damage occurs to the Motorcycle, or mechanical difficulty arises, You will immediately notify MotoGreece and will act in accordance with instructions given by MotoGreece. 4.4. If damage is caused by the misuse or abuse of the Motorcycle, You will remain responsible (a) for the rental charge for the remainder of the unexpired rental period and (b) for costs incurred by the cancellation or postponement of the hire of the Motorcycle to future customers as a result of its unavailability. 4.5. Where a motorcycle has been crashed or has mechanical failure and is not able to be ridden any further, the Company is under no obligation to replace or supply another motorcycle and no compensation can be claimed by the Renter for the unused portion of the rental period. 4.6. If MotoGreece is able to provide a replacement motorcycle, this procedure may bear additional costs for the Renter, which (the costs) are dependent on distance and methods of delivery. The Renter will be notified about the costs and the delivery of the replacement motorcycle will take place only with his written acceptance (via SMS or email or other messaging application) of these additional costs. 5.1. Theft Excess: You have the obligation to compensate MotoGreece in the event of theft (total or partial) or loss (total or partial) of Motorcycle, up to the amount designated as “theft excess” in the front side of the rental agreement . 5.2. If no theft excess is designated, then your financial liability is up to the full amount of compensation required by the Company. 5.3. It is expressly agreed that theft or loss of: parts, accessories and/or equipment (including panniers, boxes, gps, helmets, locks) provided by Motorcycle are not covered by any insurance coverage and therefore You are liable in whole for those items. 5.4. In case of theft or loss of Motorcycle, You must report the incident in writing at the nearest police station as soon as possible and no later than within 24 hours and then contact us. (a) The charges per kilometer covered by the Motorcycle during the rental period based on the unit price per kilometer as designated in the front side of the rental agreement. The number of the covered kilometers is computed according to the indications of the kilometer counter of the Motorcycle at the beginning and at the end of the rental period. (b) refuelling charges if Motorcycle is not returned with a full tank of fuel. Refuelling charges are set as: 1. if fuel level indicator shows above half-full but tank is less than full when visually inspected : the charge is 15 euros 2. if fuel level indicator is anything between half-full to reserve: the charge is 25 euros. 3. If fuel reserve indicator is on: the charge is 30 euros. (c) In case of an accident due to Renter’s liability, a non-refundable fee of 30 euros+VAT to cover administration expenses. (d) Taxes, duties and other expenses, including attorney’s fees and default interest incurred in collecting any kind of payments due, related to this rental or related to the repossesion of the Motorcycle by the company. (e) Any fines, penalties, court costs, and other expenses impossed, or to be impossed, on the company due to the illegal use of the Motorcycle by the Renter, plus an administrative fee of 50 euros per fine. Renter or additional driver mentioned in the front side of this agreement shall continue to be responsible for any illegal acts. (f) charges for transporting the Motorcycle if it is returned to a location different from the one designated on the front side of this agreement without the Company’s written consent. (g) a 20 euros administration fee for any unpaid toll charges, in addition to the original toll cost. You agree and accept: 1. Granted discounts will be recalled, if settlement of the company’s account is not made within the set limits. 2. All charges are subject to final audit. It is your sole responsibility to request any fuel refund and/or finalize fuel charges whilst returning the Motorcycle and ONLY at this time. Refunds or other disputes will not be processed after you have left the return location. 7.1 You are expected to take good care of Motorcycle, to preserve it in good condition, to check its mechanical condition, to lubricate the transmition chain at least every 600 kilometers, to check the oil and water level daily, to check the tyres etc, and in general to behave in a prudent matter. 7.2. Any repair of motorcycle by You or any other person is prohibited without the company’s prior written consent. 7.3. Motorcycle must not exit Greece nor be loaded on train or ship or other mean of transportation without the company’s prior written consent. 7.4. Motorcycle must not be used: (a) to carry property or persons for hire, (b) to propel or to tow any other vehicle, trailer or other object, (c) to participate in or to follow rallies, races or competitions of any kind, (d) for subleasing by Renter to any third party, (e) for purposes contrary to Greek Law, (f) while Renter or the additional Motorcycle driver is under the influence of alcohol, hallucinatory drugs, narcotics, barbiturates, or any other substance impairing conciousness or ability to react, (g) in contravention of any customs, traffic or other regulations, (h) by any third person other than the Renter and additional driver mentioned in the front side of this agreement, (i) to make illegal transports or to perform illegal acts. 7.5. You agree (a) not to attempt to sell, dispose of or encumber the Motorcycle in any way, (b) not to alter the Motorcycle, including any identifying markings, without Company’s prior written consent. 7.6. You are solely responsible for the ignition keys during the rental period. Should they be lost or stolen You are responsible for the replacement to a maximum cost of 400 euros. Additionally you are liable for any express post services to send spare keys to you. 7.7. In the event that the rider is unable to deliver the motorcycle to the agreed location, regardless of the reason, we reserve the right to charge you the cost of the relocation of the motorcycle. This cost will vary depending where the motorcycle has been left. You expressly agree that the company is not responsible for any loss or damage suffered by You or third parties, during the rental period and no claim can be raised against the company for the above reason. The Company nor any of its personel, can not be held liable, individually or collectively, in any way for any occurrence in connection with the operation of this rental agreement which might result in injury, death or damage to Renter, his property or his family heirs or assigns. (a) not acknowledge liability or guilt and claims of third parties in any way, direct or indirect. (b) Note the names and addresses of eye witnesses and also the name and the address of the driver and the data of the vehicle, with which Motorcycle may have collided. (c) Notify the police to investigate the liability of the third party and provide care to any injurors. (d) Contact the company immediately by phone or other means and act in accordance with instructions given by the Company. (e) Obtain all relevant information from any third party. (f) Photograph the location of the accident, and the vehicles participating in the accident, if possible. Renter must complete and sign an accident report within 24 hours and send any relevant documents or information to the company. (g) You agree to provide all assistance reasonably required by the Company in relation to the accident, including the provision of statements, information and documents and will attend court to give evidence and meet with Company’s lawyers as required in relation to any legal action arising in connection with the rental of the Motorcycle. 10.1 Third party insurance: The company provides Renter and any additional driver mentioned in the front side of this agreement, with insurance coverage by insurance companies of its choice for death or injuries of third parties, passengers or not of Motorcycle (the Motorcycle driver is excluded) to the total maximum amount of 1,200,000 (one million two hundred thousand) euros, and for material damages of third parties properties to the total maximum amount of 1,200,000 (one million two hundred thousand) euros, provided that they do not violate any term of this agreement. 10.2. Theft Coverage and/ or Damage Coverage : see clauses 4 and 5, set above. Renter consents to the storage of his personal data included in this rental agreement. It is strictly agreed that the company is authorised to use such data, when Renter at time of rental makes incorrect statements or violates the terms of this agreement and to pass on such data to the country Authorities in case there is suspicion of commiting a criminal or other offence. (a) Motorcycle is always property of MotoGreece Private Company. This is an agreement of rental only. Renter is not the company’s agent in any way and in any case. Renter acknowledges that he acquires no rights other than those stated in this agreement. (b) During the rental all additional drivers are jointly and severally liable with the Renter. (c) Likewise, in case that this agreement is signed by any representative of the Renter, he would be jointly and severally responsible with the Renter. (d) This agreement supersedes any other prior written or verbal agreement between the company and Renter. (e) the company cannot waive any of its rights deriving from the law and this agreement. (f) Any alteration of the terms of this agreement is not valid if not agreed in writting. (g) Renter agrees and accepts that all abovementioned terms are valid both in case of the initial agreement with the company and in any case of extension of the time of the rental and/or replacement of the Motorcycle by another. (h) In case there is difference between the copies and the original of this agreement , the original possesed by the company always supersedes. (I) The contracting parties acknowledge and accept that all terms of this agreement are substantial and fundamental for the purpose thereof. (j) If you have violated the terms of this contract or if you have been riding same in illegal manner or in violation of the Greek driving code, You then have the obligation to compensate the Company for all losses and damages suffered by the Company. This agreement is governed by Greek Legislation and any and all disputes which may arise between the company and the renter from this agreement will be subject to the exclusive jurisdiction of the courts of Athens in Greece.